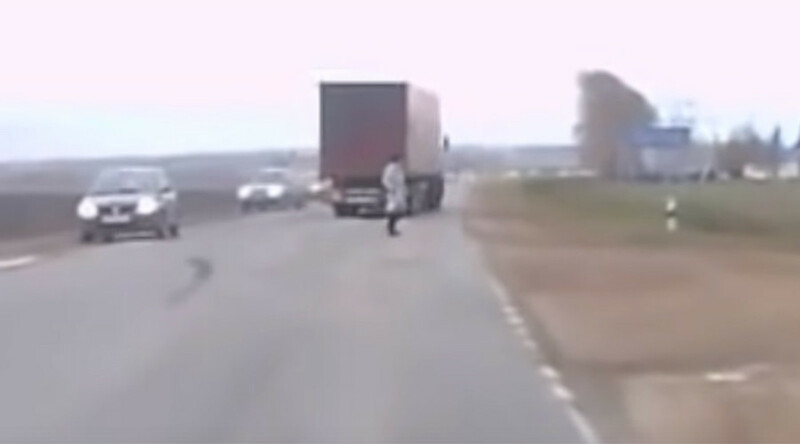 Dashcam footage of a truck driver’s near miss with a pedestrian on a busy Russian highway has sparked a bizarre internet theory that scientists, backed by Vladimir Putin, have mastered teleportation. The ability to instantaneously leap from one place to another far away has been so far confined to sci-fi novels and movies. But that hasn’t stopped science buffs and fans of the paranormal from clinging on to a 2012 YouTube video for any hope that the technology that warps the space-time continuum has arrived. The video, posted recently online to the Paranormal Elite channel, has so far been watched thousands of times. According to some viewers, it shows a person “teleporting” into the middle of a highway and directly into the path of an oncoming lorry. One British tabloid went a step further by asking if their go-to bogeyman Vladimir Putin is behind the ‘teleportation’ incident. Some commenters believe the video to be a “100% real” example of teleportation, with other viewers suggesting the person appearing suddenly in the road is in fact a “ghost”. “A really shocking video. The fast truck’s move and the immediate appearing of the woman gives us a sense this video is 100% real,” one person, convinced this is evidence of teleportation, wrote. “She was in the middle of the road long before the truck reached her,” another commenter added. Despite the fantastical theories, the truth appears to be that the person ran onto the road, before the truck driver was forced into evasive action and avoid a potentially fatal crash.